With its blazing red graphics and its innovative 'adaptive' camber, Atomic's Crimson Ti ski was poised to become the go-to All-Mountain plank in my ski quiver...and then I tried it. The Crimson Ti has made favorable impressions across the review circuit, scoring points for its fusion of huge edge grip with the sort of lift/flotation not typically found until you enter the bona-fide mid-fat category. But the big news with the Crimson Ti is its pioneering use of so-called adaptive camber. What, exactly, is Adaptive Geometry, you ask? 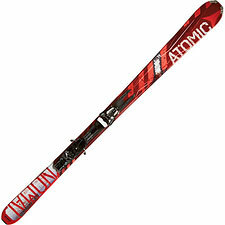 It is an attempt by Atomic (and several other ski manufacturers) to meld the magical turn initiation qualities of a rockered ski with the hard snow carving ability of a cambered racing thoroughbred. A passive technology, Adaptive Camber effectively changes the ski's profile geometry as the ski is tipped on edge. When the ski is flat against the snow and weighted, the profile is rockered, with a gentle early-rise tip for effortless turn initiation without edge-catching. But tip the ski on edge, and the ski delivers full-length edge contact for solid, predictable edging. It's a clever bit of engineering, and it does indeed achieve its objective. On snow, the Atomic Crimson Ti initiates turns easily, while simultaneously offering all the big-big edge grip you'd expect from an Atomic pedigree. To me, the edges were a bit grabby, but I will cautiously attribute that to the bevel angle of the tune job on the demos I was skiing. Regardless, there was no question that the Crimson Ti offered tenacious (even excessive) grip on the hardest snow. Pressure the edge, and it bites like a rabid animal. Large-radius turn stability was very good. In the 185cm length, the Crimson Ti rewards speed, not-so-subtly inviting you to point them down the hill and let 'em run. Quickness? Not so much, especially in this length. You feel the weight of those fat tips and tails underfoot, and my guess is the adaptive geometry necessarily introduces a lag time in responsiveness when you're shifting the ski from edge to edge. You'll have no problems rocketing big GS turns down the hill, but shift your hard snow technique toward a more upright, slalom turn, and things get downright sluggish. What's interesting about this hard snow performance is that we're still talking about a ski that isn't that far removed from the surface area of a Volkl Mantra (133-96-116mm). You're not going to mistake the Crimson Ti for a modern, rockered powder ski, but it certainly isn't going to send you home in disgust when the snow gets soft and deep. So, credit the Crimson Ti for its solid performance across the snow spectrum—exactly what you'd expect from an All-Mountain ski. But call me unconvinced when it comes to overall impression. Yes, the Crimson Ti does handle everything competently, but it doesn't do any one thing outstandingly. I would be especially careful about choosing it in the longer lengths. The shorter sizes have tighter radii and are likely more lively. The Crimson Ti may make sense as a traveling ski, when you can't take more than one pair with you, or for carving-oriented skiers who only want to own one ski, and are seeking maximum versatility in unknown/unexpected/mixed conditions. But for me, the 185cm Ti was just too big of a ski—and too much of a generalist.